What? Surely it’s Twelfth Night or Twelfth Day. Indeed, whilst that debate rages about….and some people take them down on Boxing Day I hear. But the real debate is Twelfth Night or Candlemas?. This debate certainly is quite germane with me, who sits here, composing this post on the 25th January in the shadow of a fully decorated Christmas tree! Why I’ll explain in a minute. However, when discussing the fact I still had the tree up on Plough Monday, Frank a folklorist and local Historian said ‘You’ll get back luck then’ to which I replied with the following fact from what I had discovered researching customs, that Christmas decorations were to be burnt at Candlemas north of the Trent of Nottingham, where it is said that candles must be thrown away. And at Twelfth Day their Christmas end. At Candlemas they finish it. It makes good sense as Candlemas was the Feast of the Purification, the last feast which signified the baby Jesus’s acceptance at the Temple. Being no longer a baby in a Manger but a baptised child. Furthermore as this was a lean time of the year agriculturally it would have little impact. It may also be significant to note that Candlemas Eve was and is Imbolc, the old Pagan celebration and perhaps taking down before may have been a way of distancing from the pagan past. 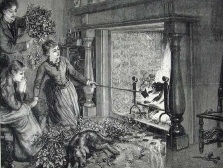 Is it possible that the authorities wanting to discourage the festivities which associated with the date, especially the Lord of Misrule, established this date as the one when Christmas officially finished and everyone went back to work, especially as in the 1800s communities moved from largely agricultural to industrial. Well perhaps it’s not quite a demised custom, I inadvertently have done so and so I gather do some churches, mainly Catholic, although I have not heard of any from Britain. No that sort of custom has never demised!